The concept of a British Isles Vitreoretinal Society was conceived by David MacLeod, Tony Chignell and Peter Leaver. Their fellows at the time were David Wong, Paul Jacobs and Charlie James. This group of six are considered the founder members of the society. The first meeting was held at Keeble College in July 1986. From 1993 BEAVRS have had an international visiting speaker who has given a guest lecture and contributed to discussion at the meeting. The list of luminaries invited has included Alain Gaudric, Peter Wiedermann, Carl Claes, Michael Trese, Cynthia Toth, Berndt Kirkhoff, George Williams, Jan Van Meurs, Don D’Amico, Ian Constable, Arndt Gandorfer, Stanislaw Rizzo, Kirk Packo and Antonia Jouseen. The visiting lecturer was originally sponsored by Alcon, from 2012 onwards it has been the BEAVRS visiting lecturer and is jointly funded by all the meeting sponsors. For the first 24 years of its existence the Society prided itself on having no formal structure. However, the size of the meeting is such that this would place an untenable financial burden on the host unit. 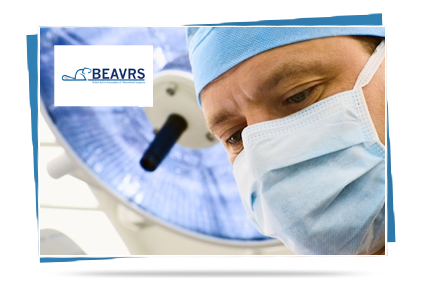 A decision was therefore unanimously taken at the 2009 BEAVRS meeting in Amsterdam to formalise the structure of the Society and the first board was elected in 2010 at the 2010 meeting held at Celtic Manor, Wales. In the subsequent 4 years we have accrued a war chest with which to underwrite the meeting and other BEAVRS activity, advised on revalidation and set up an online national retinal detachment audit.